Despite the demolition of the Calais ‘Jungle’ camp, thousands of refugees are still in Northern France. Organisations on the ground in Calais are desperate for volunteers to help carry out a variety of roles. This could range from helping out in the warehouse to translating for detained refugees in detention centres. If you are able to give up some time to volunteer, please contact one of the organisations listed below to register your interest. Volunteers are still sorely needed in Calais. Volunteering is richly rewarding and also very enjoyable. It includes sorting and distributing donations, working in the food kitchen and building shelters. Care4Calais run several operations in Northern France. They need volunteers to help find homeless refugees and asylum seekers, help cook and run the children’s centre, visit accommodation centres, visit those in detention and to sort and organise their warehouse. If you have not volunteered in Calais before, you will need to fill out a New Volunteer Registration Form. If you’ve volunteered already and would like to do so again, use this form to let them know when you will be there from. 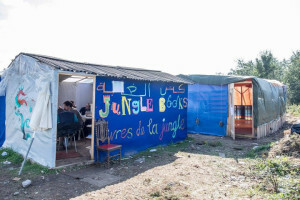 www.calaidipedia.co.uk is the place to go to find out about the current situation in Calais and to answer any questions you have regarding volunteering there. Join the facebook group to get further updates and to speak to others volunteering. Here are some Frequently Asked Questions from Calaidipedia. Any questions that aren’t answered above, email volunteerincalais@gmail.com. Donations are also urgently needed in Calais. View the list of current needs and make sure to email calaisdonations@gmail.com before any delivery so they know to expect you. You can also drop off donations in the UK which will then be taken to Calais. To find your closest drop off area for much needed clothes and goods please take a look at Refugee Maps. Following a request from the Mayor of Dunkirk, Médecins Sans Frontieres have built a new camp for refugees in Dunkirk that adheres to international humanitarian standards. Residents of the new Grand-Synthe camp however are entirely dependent on the support of volunteer organisations. Volunteers are urgently needed in the camp to ensure that the aid available for the new camp is accessible to its residents. Utopia 56 is the key volunteer organisation that coordinates volunteering in the camp. Volunteering in Dunkirk covers a range of tasks which change on a daily basis and you will need to be adaptable. Utopia56 provide volunteers with cheap and shared accommodation whether in a mobile home, at a local’s house or in a dorm, for €5 a day. Register to volunteer with them here.